Monaco and Monte Carlo was not what we expected. They had just hosted the Grand Prix the day before, so there were barricades and viewing boxes all over. Our tour guide told us that for the past week the people of Monte Carlo couldn't even cross the street due to all the barricades. We went up to the top where the Palais du Prince is located and had some lunch. Afterwards we watched the changing of the guard. 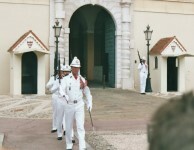 It was very similar to the changing of the guard in London but with a little more fanfare. The view of the harbors from the top was very nice. There were many luxury yachts moored in the harbors. Unfortunately the weather wasn't as warm as predicted and few people, including myself, brought jackets. A few of the women bought shirts to keep warm. After leaving the Casino area we got back on the bus and went to the Jardin Exotique de Monaco. Most of the plants there were succulents including many aloe plants in bloom. Now I know what to look forward to if my aloe plants ever get that big. We walked through the garden to the Prehistoric Anthropology Museum that contained photos of cave drawings and prehistoric human remains. It turned out that the founder of the garden was also into archeology. The reason we went to the museum was to waste time until our guide showed up to give us a tour of the cave. Unfortunately the guide never showed up, but we explored the cave anyway with several other tourists that I think were from Ireland. (Aaron thinks they were from Canada.) The tour was conducted in French, and even though I don't speak French, I was able to understand most of what he was saying. (First he apologized that his lecture was only in French. Then he explained about the formation of the cave.) As far as caves go, this one was not too exciting. It was all limestone with no color variations and the caverns were fairly ordinary. 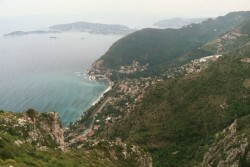 On the way back to Villefranche from Monaco we stopped in Eze. Eze is a medieval village perched on a narrow rocky peak overlooking the Mediterranean sea. In Eze we split into two groups. Some people stayed in the lower part of the town to do some shopping while another group of us hiked up to the top where there were some interesting shops, a church, and a nice view. When we first arrived in Villefranche one of things that caught my eye was the Christina O anchored offshore. For those that don't know, the Christina O is listed as one of the top luxury yachts in the world. It was owned by Aristotle Onassis and named after his daughter, Christina. It was used as his "floating home" from 1954 to 1975. In 1998, John Paul Papanicolaou, a family friend of Onassis, bought the ship and after a three-year, $54 million restoration turned it into a charter yacht. After the tours we had some time to explore Villefranche itself. One place I found particularly interested was a very old covered street that looked like it had been built in medeval times. For some reason I failed to take a picture of it. 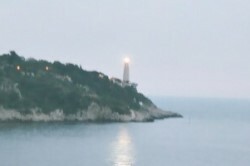 As the ship headed out of port on our way to Livorno Italy I captured this great photo of a lighthouse.